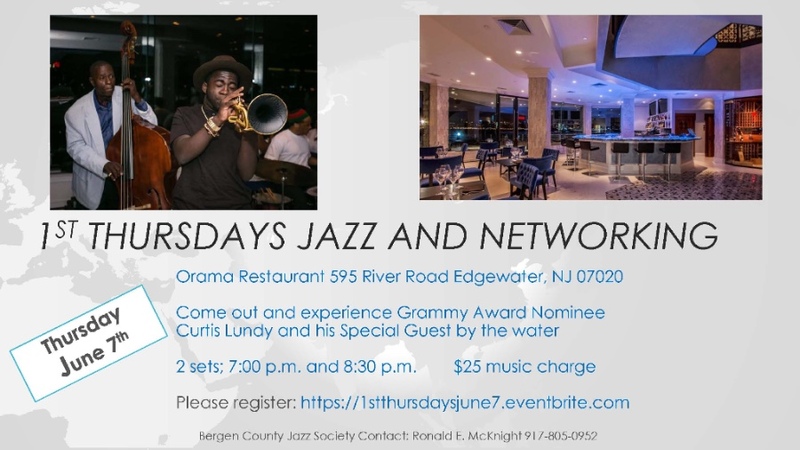 WHEN: Thursday June 7, 7 to 10 P.M.
Music lovers can get a jump-start on weekend fun with an evening of great jazz from acclaimed bassist and bandleader Curtis Lundy on Thursday, June 7. The event marks the return of the yearly 1st Thursdays music series at Orama Restaurant in Edgewater, NJ. Signaling the unofficial start of summer, the popular annual concert is presented by the Bergen County Jazz Society. For the past several summers, 1st Thursdays has been a destination for a lively and enthusiastic crowd looking to soak up the sounds and the scene. Bandleader Curtis Lundy can be counted on to assemble a brilliant ensemble of friends from the musical world to set the mood. Whatever your top picks are for a perfect summer evening, you’ll find them at Orama. In addition to the exciting music, it’s hard to beat the atmosphere: Sited on the Hudson River, Orama’s floor-to-ceiling windows frame amazing scenes of lower Manhattan. Relax, take in the spectacular views, peruse the eclectic menu ranging from sushi to small plates to full meals, along with a creative cocktail program and extensive wine list. Or kick back at an outdoor table, enjoy a cigar and watch the boats go by, with the Manhattan skyline gleaming just across the river. Providing a live soundtrack for it all is the multi-talented Curtis Lundy. He has long been recognized among the premiere figures in straight-ahead jazz as a bassist, bandleader, composer, and arranger. Lundy gained attention early, accompanying the renowned vocalist Betty Carter, who was famous for seeking out the best young players. Lundy later carried on that tradition with Horizon, a band he co-led with saxophonist Bobby Watson. Favorably compared with Art Blakey’s Jazz Messengers, one of the most celebrated and beloved jazz ensembles ever, Horizon built a reputation as a proving ground for many of the most promising up-and-comers on the jazz scene. Founded in 2016 by Ronald E. McKnight and Curtis Lundy, the Bergen County Jazz Society aims to help people of all ages have a greater appreciation of jazz. Besides working in the school system and mentoring programs, the BCJS assists musicians in need of food, housing, work and medical care. You won’t want to miss the fun on June 7, when 1st Thursdays returns to Orama!